The specialized foods available at the Japanese version of McDonald’s are pretty incredible. The Japanese have strange tastes, and the things they associate with America are even stranger once filtered through the Japanese culture. However, it’s still McDonald’s. That’s what makes it so fascinating. It’s as familiar as the restaurant down the street and as weird as all get-out. Now, McDonald’s Japan is back to celebrate the anniversary of a uniquely Japanese food item: the Moon Burger. 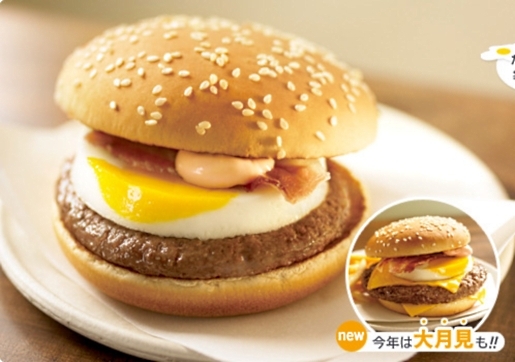 The Moon Burger was first launched in 1990, and has become one of the most notorious of Japanese McDonald’s creations. It’s a hamburger patty topped with a fried egg, bacon, cheddar cheese, and something called “original Aurora creamy tomato mayonnaise” all on a sesame-seed bun. When you opt for the Great Moon Burger, rather than just the Moon Burger, you get a beef patty that’s 2.5 times the size of the normal Moon Burger, plus all the trimmings! The Great Moon is an impressive 716 calories, 38.4 grams of protein, 46.8 grams of fat, 34.3 grams of carbohydrates and 2.8 grams of sodium per burger. Y’know, health food! Top that, Burger King pizza burger!